For the Life Savers 100th Anniversary, Firstborn was asked to create a new website that celebrated the brand’s rich history while carving a distinct path for the future. 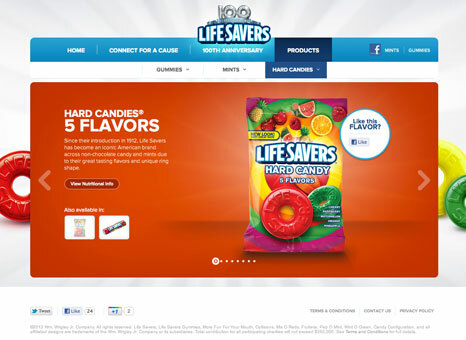 As part of their 100th Anniversary celebration, Life Savers wanted to rebuild their online home. They needed a site that could easily adapt to changing promotions throughout the year, engage consumers with the brand’s history, better-incorporate social media and show off a fresh new look. 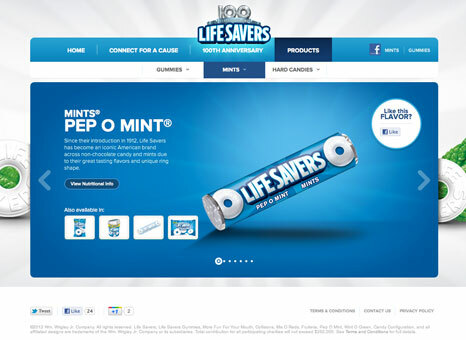 The new Life-Savers.com serves as the major launching pad for new brand initiatives, starting with the Connect for a Cause charity promotion. 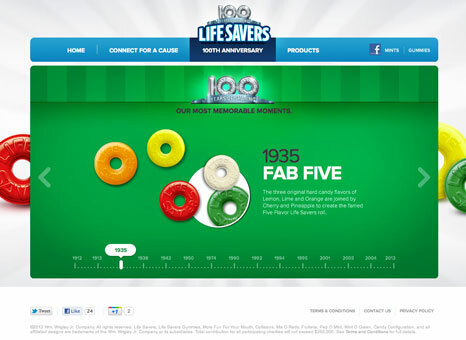 An interactive timeline was created in honor of the 100th Anniversary, allowing users to explore memorable moments from the history of Life Savers. Enhanced product profiles get fans closer to their favorite flavors. The site was built using HTML5 and a version optimized for mobile was also created. Now fans can experience Life Savers in more ways than ever before.